Zerodha Kite is one of the top and unique selling propositions by Zerodha, India’s leading discount broker. This web-trading application allows you to trade and invest across multiple segments with utmost ease and convenience. One of the major selling points of this application is its consistent upgradations. 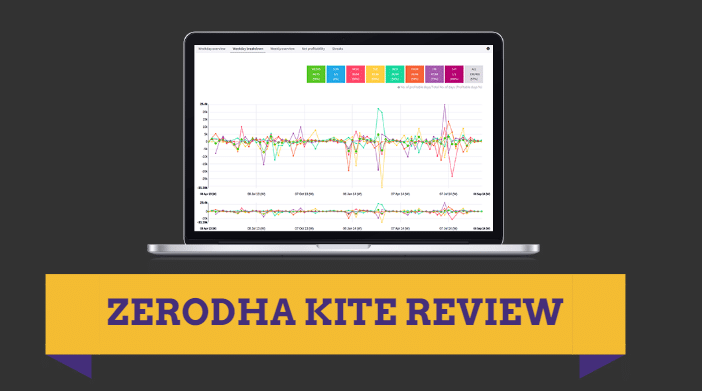 In this detailed Zerodha Kite tutorial, let’s have a thorough look at some of its best features and understand how it suits your trading needs. Zerodha is known to be one of the technology innovators in the Indian Stock broking space, especially when it comes to discount broking. Zerodha’s trading platforms boost of optimal user experience, features and performance. Zerodha Kite is one of those platforms that are lightweight, easy to use and are HTML5 based where users do not need to download or install any software. It comes in both Web as well as Mobile versions. For an understanding of the mobile variant, you can check this review on Zerodha Kite Mobile App. As per the web version, the application is currently available as Zerodha kite 3.0. The Zerodha Kite web version comes in a responsive format, implying you can use this trading application across the devices without any interference in your trading experience. There are other trading platforms offered by this discount broker such as Zerodha Streak, Zerodha Coin, Zerodha Pi for different client requirements and trading preferences. Kite has been used by more than 800,000 clients and Zerodha claims to process 200 million requests every day through this platform. Kite is available in 10+ regional languages including Hindi, Kannada, Telugu, Tamil, Malayalam, Marathi, Bengali, Gujarati, Punjabi and Oriya. 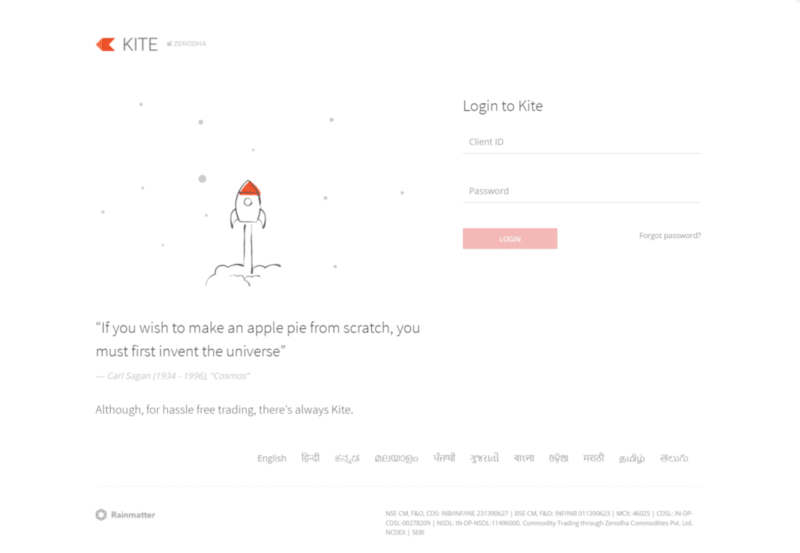 Kite is a lightweight application and uses minimal internet bandwidth. Thus, users staying in third or fourth tier cities do not face much of a connectivity issue in using Zerodha Kite. An example of its light usage is that its market watch feature consumes less than 0.5 Kbps of internet bandwidth. The application provides a single exhaustive “Search” feature that allows you to search across tens of thousands of records of scrips, financial products, contracts across different trading segments and indices. This feature comes in handy for traders who are looking to search and monitor different stocks before trading and placing their capital. When it comes to Zeordha Kite Charts, there is a wide range this trading application provides to its users. Such functionality is useful for all kinds of traders and investors irrespective of their trading experience, objective and goal orientation. Advanced charting feature offers 6 different chart types including Helkin-Ashi, Kagi, Linebreak, Point and Figure Charts, Range Bars, Heikin Ashi Charts and Renko Charts with 100+ technical indicators and 20+ drawing tools. This feature is of utmost importance to users who perform their technical and fundamental analysis on their own. As far as the timeline is concerned, for intraday charts, the tool provides data since 2014 and you can have daily-level charts for the last 7 years across different trading segments. With its minimalistic user interface, Zerodha kite offers one of the best user experiences to its clients with easy navigation and high usability along with a provision to set-up shortcut keys (explained later). This is useful especially for beginner level traders who may find it hard to understand the complexities of trading software. Zerodha kite provides you notifications on your web browser with all sorts of updates related to your demat account, market movements, important news and other related information that can be deemed important. Such notifications help you in taking important actions at the right time. 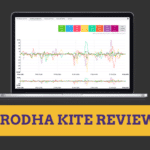 If you are someone who likes to perform fundamental analysis or even technical analysis on the stocks before placing your trades, Zerodha Kite offers you a wide range of data points. Such data points include different ratios, information of P&L, cash-flows, shareholding patterns, corporate actions and so on. You may choose to place different orders as the platform provides trade product options such as CNC (Cash n Carry), MIS (Margin intraday square off), NRML (Normal F&O). Then there are various order types such as Market Order, Limit Order, Stop loss Order etc. Easy order placement feature with a single click across multiple order types. Although, you may choose to use the regular order placement feature by going through that specific functionality, however, Zerodha kite offers you a single-click order provision. This feature is useful for intraday traders where profits can convert to losses within a matter of seconds. In-built integration with Quant, an analytical tool built by Zerodha, allows clients to perform fundamental analysis through behavioural analytics. Furthermore, you can integrate with tools such as Zerodha Sentinel, Zerodha Streak or even Zerodha Smallcase. Up to 5 Market watch lists with 40 scrips allowed in each market watch list. 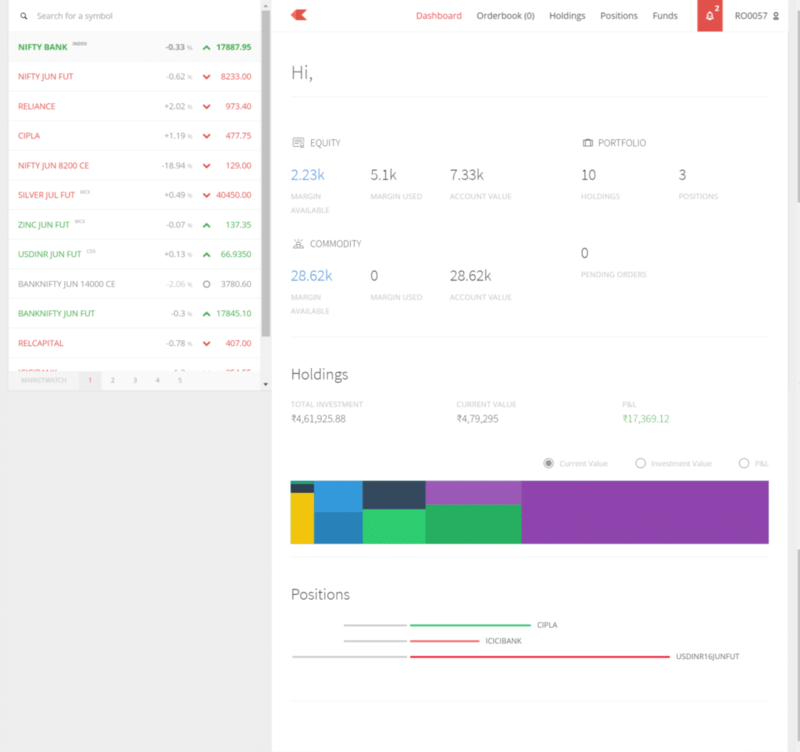 Although, this is a generic feature and is available in most of the trading applications, however, Zerodha Kite Market watch feature is reasonably easy to use. Shortcut keys for easy access to features that may otherwise require whole navigation to go through. You can personalize these shortcut keys as per your convenience as well. Although these features are provided in isolation as well, this trading platform also allows you to use any of these within the application too. As per the broker’s claims, you can search for around 90k stocks and derivatives products across different indices. These products can be stocks, commodities, currency pairs, indices (for that matter). That is definitely one of the widest ranges offered among different trading platforms. As soon as you open the account with Zerodha, you are sent a couple of confirmation emails by the discount broker. One of these emails contains login information to Zerodha Q which is the reporting tool provided by the broker to its clients. The other email contains the login details of Zerodha Kite including a one-time password. Once you access the application using these credentials, you are required to change the password as per your preferences. Once you login into the application, by default, you will be provided with a tour of the application with each step being explained for your ease later. You can transfer funds from and into the Zerodha trading account in a pretty straight-forward manner. For moving money into your trading account, you have the option to choose from any of the provided 20 banks. You may choose to use either of the transfer methods including NEFT, RTGS or IMPS, where IMPS transfer may happen almost instantaneously while NEFT may take a few hours. Backtesting not possible using Zerodha kite. Feature to place order directly on the chart is not possible as of now. Single sign-on feature not possible yet. 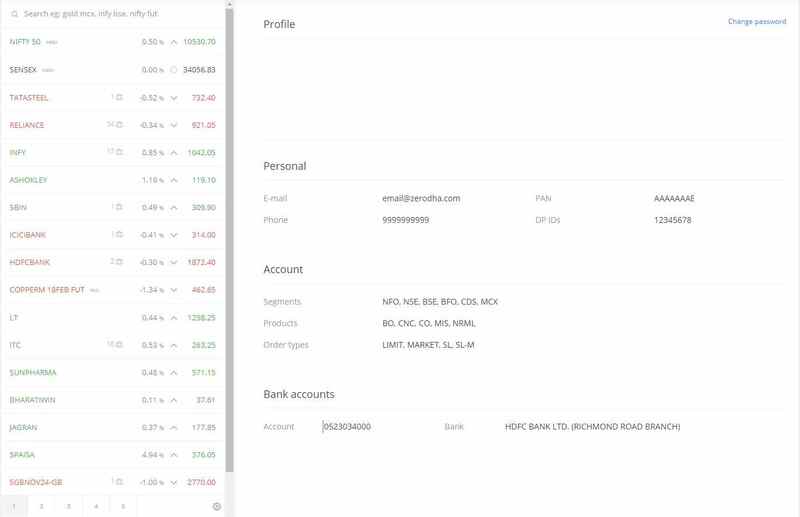 One of the best trading platforms that offer multiple integrations with third-party tools such as Varsity, Quant, Zconnect etc. Available in multiple languages so that users who do not understand English well can trade in their regional languages. You may choose to subscribe to Zerodha kite alerts and notifications to stay informed about any specific news the broker wants to share about this application. 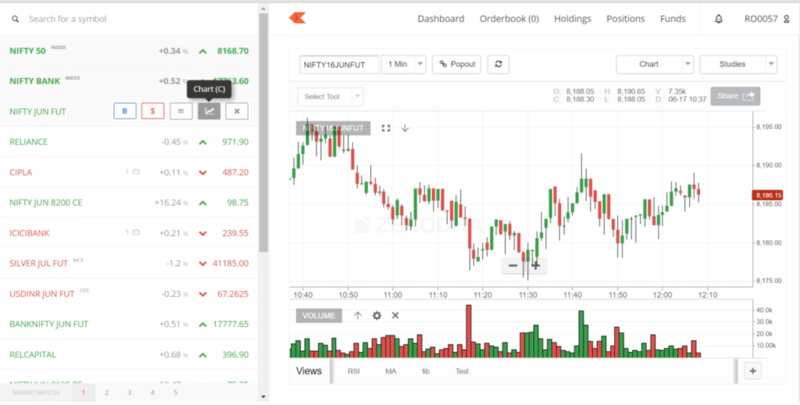 Zerodha Kite can also be availed in the form of a chrome extension where specific features (such as order placement, stock tracking etc) can be accessed. This is one of the rare benefits of using Zerodha Kite. 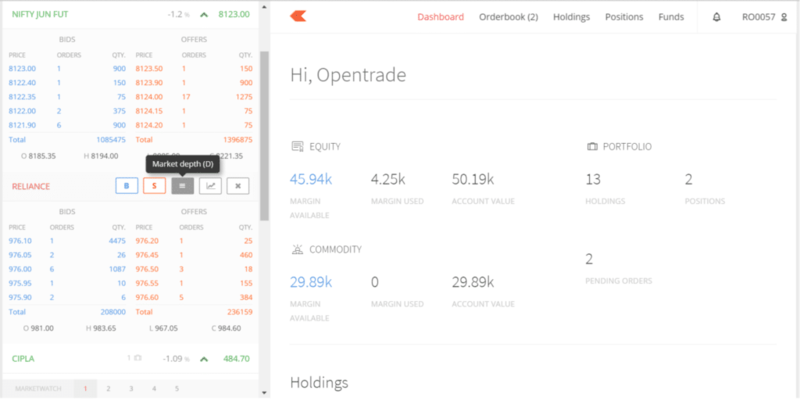 Zerodha kite charges are nil and the stockbroker levies no separate charts for the usage of this application from its clients. As mentioned earlier, Zerodha kite is available in a mobile version as well. In case Zerodha Kite is not working, you may get in touch with Zerodha Customer Care team right away. Fund transfers across multiple banks possible with minimal clicks. As far as the final thoughts on this trading application are concerned, Zerodha Kite is an apt web-application for users that are looking for a high-performance software with a wide range of features. If you are a beginner level trader, it may take some time for you to understand the different features offered in this application and how the overall navigation works etc. However, with time things become much easier to use. Having said all that, there are times of high-traffic, when the software may see some downtime or any other related challenges. Thus, you need to be cautious during these instances. Overall, it can be termed as one of the best trading platforms in the country. I am facing problem from last one week. When i try to login its not working or when try to change the password it says your Pan no wrong or your email id wrong. And when try to call its customer service no its only switch off and busy or not reachable. This is the service of this company. And today i got message from zerodha that my account debit Rs. 489.380 or your payment withdrawl request has been processed. You say if i am not able to login in my account then how could i withrawl money from it or make a request to you. One of the worst service and i think every trader should aware from this that the their hard money is not safe in zerodha.